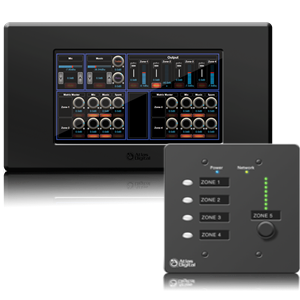 Easily add touch control with the BlueBridge® 7" touch screen panel at an affordable price point. Networkable, multi-page flexible, advanced control and password protection - at the touch of a finger. 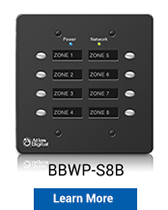 Our Wall Controllers are DHCP enabled network devices and can be POE powered. 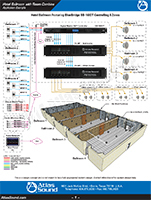 They are connected using Ethernet cable and reside on the network with connected BlueBridge® processors. Easily program them using a one step, drag and drop configuration from within the BlueBridge® software. We recommend powering our wall controllers via a POE switch or router but an external power supply is included with each. 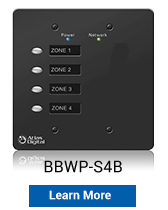 Desktop control is done via BluePanel software configured with BlueBridge® Designer software. Mobile control via iOS and Android app. 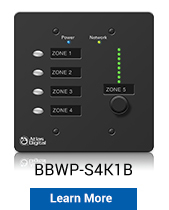 The BlueBridge® SM-1 device provides web browser control and advanced features such as presets scheduling, RS232 third-party control, and system-wide backup storage. 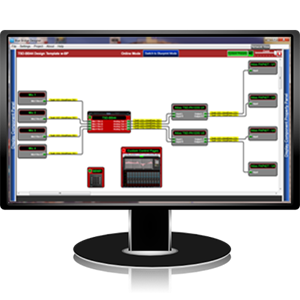 All BlueBridge® models provide full system control and monitoring via a standard network infrastructure. 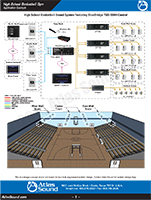 On select models, you have the capability to stream digital audio onto the network using Dante™ digital audio protocol. 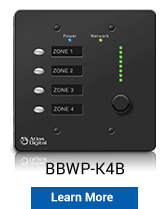 This allows BlueBridge® processors the ability to send/receive digital audio from third-party devices. 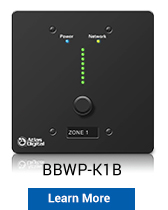 All BlueBridge® microphone pre-amps are studio grade and built by THAT® Corporation. 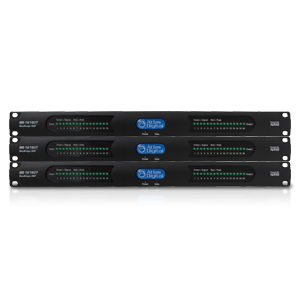 This extraordinarily quiet design handles both mic and line levels with accurate and precise performance with ultra-low distortion You get excellent quality sound that outperforms most digital mixing consoles and recording devices. 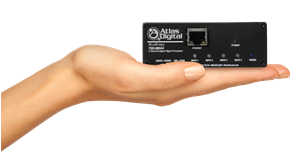 An industry-first network DSP device providing incredible quality sound, processing capability, and control - that fits in the palm of a hand. It comes in two versions - 2 in x 2 out or 4 in x 4 out. 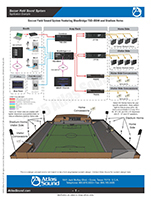 This is the ‘installers toolbox’ DSP that can be used in all your everyday projects. 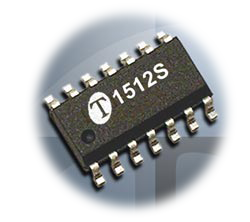 Multiple models to provide the right channel count and features for your application. If you’ve ever programmed any DSP device, our designer software will take you no time at all to become a master. It was architected with intuitive navigation and quick drop & drag programming. Download our software and take a tour. 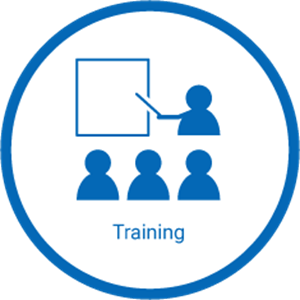 Our online training videos make the learning process easy. Click below to watch and learn.